How to answer, “Why consulting?”, in an interview is a must have skill for any prospective consultant. The question is so common, you can pretty much take it to the bank that you’ll hear those words from the person interviewing you, whether it’s McKinsey, Bain, or Boston Consulting Group. Take a listen to Jenny Rae, ex-Bain consultant, as she teaches you how to answer this important question. Hi, I’m Jenny Rae Le Roux, the Managing Director of Management Consulted. A couple years ago we put out a video that’s been really popular about how to answer the “Why consulting?”, question. And we’ve noticed that some of the tactics have morphed a little bit. I just want to focus right now on the best way to answer it. Not all the terrible ways, not even the structure of how you do it. This should be a couple of things. First of all, one minute long. A one minute answer is going to be succinct and really peppy. Number three, most important thing it has to be a story. And what I’m not looking for here is a list of the reasons why you wanted to go into consulting. I want to be in consulting with reason A, reason B, and reason C. That’s how consultants sometimes present things but the way that partners sell, the way that you should sell yourself, is through a story. So what you need to say is the moment I realized that consulting was a great fit for me was, and then fill in the blank. So, it could be a time that a professor shared a story inside a class that was really interesting for you. It could have been at a time that you actually worked with a consultant. It was a former consultant and they shared a little bit about the work that they did or you saw the way that they worked. It can be a time that you hired a consulting firm or someone you worked with hired a consulting firm, and you were able to see how they interacted and the kind of work that you did. Or it could be an article that you’ve read, a report that you noticed. But it should be this moment this epiphany moment and embedded inside there will be a couple of the things that you think are great about consulting. If it’s not a story, it won’t be memorable. So make sure that it’s really focused and really personal. Something that only you could share in an interview. Ready to nail your interview? 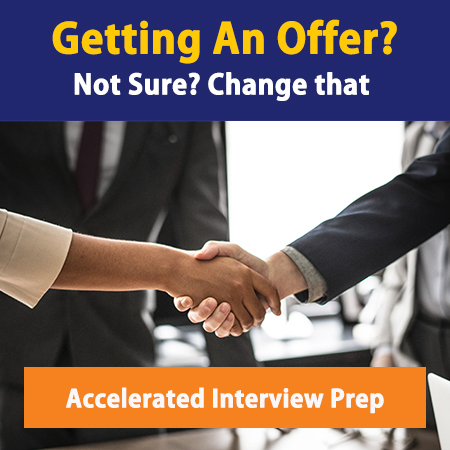 Click to see how our accelerated prep program can help you land an offer.